An unintentionally quiet month has allowed me to geek out over a long-awaited Apple CarPlay feature. Hell has finally frozen over, as Apple recently added Google Maps to its list of compatible third party apps. Almost half the world uses an iPhone, yet for many, Appleís own navigation app was a source of frustration. For years itís been playing catch up to Google Maps ñ the unofficial gold standard ñ although if you wanted to use it via CarPlay you were out of luck. Not anymore, which is a relief to me, as Iíve never been an Apple Maps fan. The rest of the CarPlay experience is usually good; it handles music and podcasts better than most built-in car systems, and that includes the Q5. However, Iíve stuck with Audiís MMI system for navigation as itís familiar, includes an always online option that includes Google search, plus it presents an easy to use interface. Audi canít take credit for the addition of Google Maps to CarPlay, as itís an industry-wide upgrade. It has meant that Iíve become re-acquainted with navigating a system designed for touchscreen use in a car that lacks this feature. Thankfully the Google Maps interface is a simple one, and voice control ñ carried out directly through your phone, not Audiís system ñ is for me infinitely better than Appleís Siri. This development does question the need for manufacturer-provided navigation options. Itís especially true on premium cars, as the added costs of extra connectivity features and other such niceties arenít exactly cheap. Especially when youíve already got a perfectly serviceable and familiar alternative in your pocket. The counter argument is that the Google and Apple interfaces are, in respect to the Q5 at least, very un-Audi-like, and a little Playmobil-esque in appearance. And you canít expand the third-party navigation app into Audiís impressive Virtual Cockpit display area. In truth Iím alright with the compromises associated with these third-party apps. And to prove that Audi doesnít always get it right either, the online news, weather, travel and web portal that can be dialled up on the main display screen is a little clunky. Think Teletext for the 21st century, itís something else thatís more than a little redundant when you have a smartphone. Still, I canít knock Audi from trying to encourage users to remain inside its ëwalled gardení of experiences and features. When youíve spent a lot of money and time building up a premium brand, you want to stamp your personality on what owners see and interact with. Sooner or later all manufacturers will have to wrestle with these new brand identity issues though. Such navel gazing wonít help me rack up the miles, which is something the Q5 continues to excel at. 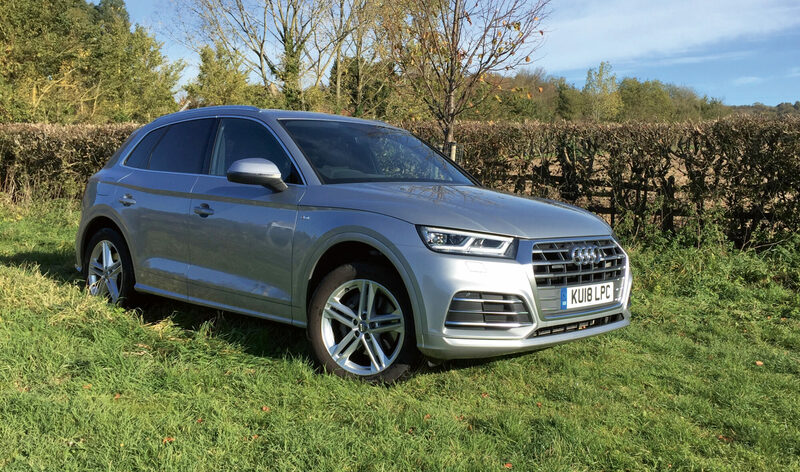 As the days get shorter and the conditions underfoot become less agreeable, I expect the Q5 to really come into its own. I foresee a lot of rain and mud in the Q5ís immediate future, and possibly some snow as winter bites. Apple’s long awaited inclusion of Google Maps has rekindled my interest in Apple CarPlay for navigation tasks. The Q5’s infotainment system isn’t perfect; the Audi Connect feature is clunky and of little use in the smartphone era.